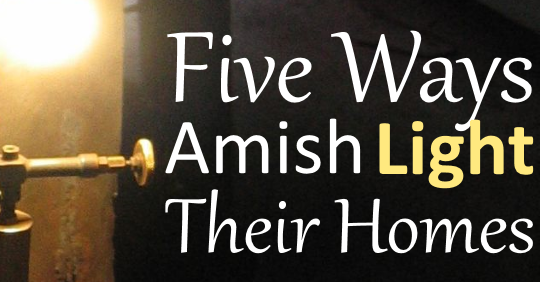 How do the Amish light their homes? Without a public power connection, it’s not as simple as flicking a switch. But Amish do have a number of church-sanctioned ways to illuminate their houses. 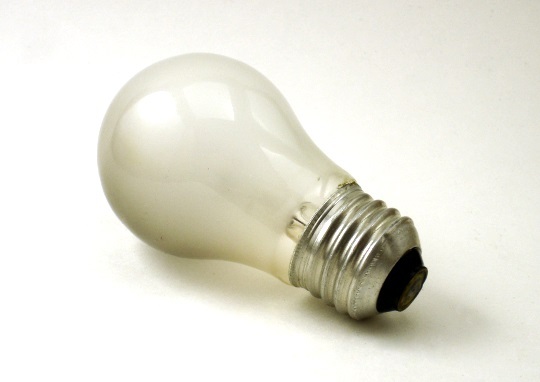 Like other technologies, lighting will vary across communities. 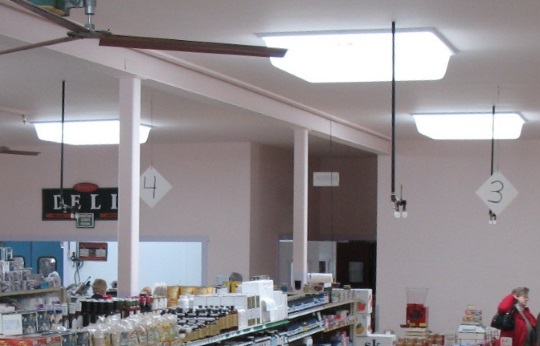 This is one of the most prevalent forms of lighting among the Amish (perhaps the most common today). Gas lighting can be portable, or built into the architecture of the home. The gas fires a thorium-based mantle which glows extremely brightly, giving off ample illumination (and heat). All you do is turn on the fuel regulator and light the mantle with a lighter (or vice versa, but you get the point). We’ve seen photos of these before, such as this built-in lighting in an Ohio Amish home, or this tall rolling mobile floor unit. I’ve even seen this type of lighting in the form of an outdoor yard light in front of an Amish home. This is the classic teardrop glass wick lamp which gives off a warm soothing glow. Not nearly as much light compared to the above. This might be how many people imagine Amish do lighting, but it is more common in the most traditional communities. 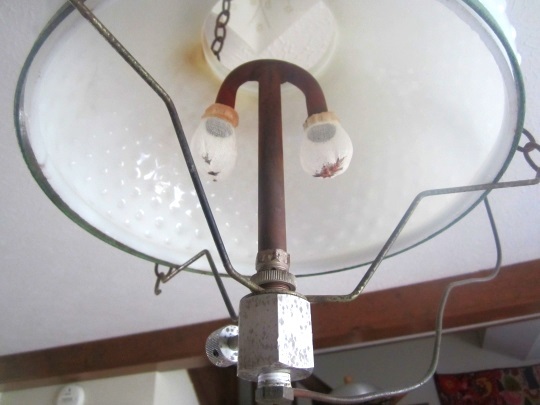 Even though the lighting choices listed just above and below this one are more popular, you still see these in Amish homes in a technologically-progressive place like Lancaster County. I use one of these sometimes at a friend’s home if my flashlight batteries die and I’m still trying to read. Another Lancaster friend fondly recalled his parents leaving one left lit on the kitchen table for him when as a youth he returned home late from running around. 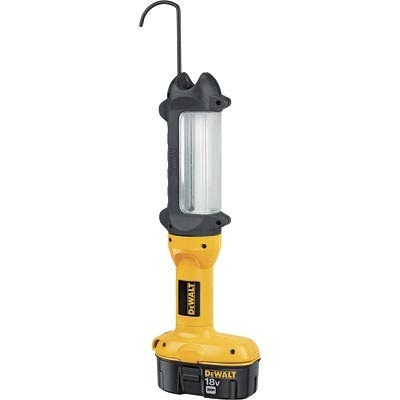 The stand-up Dewalt lights as they are called (after the maker’s brand name) provide powerful lighting which can illuminate a room. They’re especially convenient because they stand up on their own, or can be hung from a hook in the ceiling. As you can see in the photo, they are powered by an 18-volt rechargeable battery pack which pops in the bottom. You also have less-powerful smaller lights like the bedside table light mentioned here. Other portable battery lights are popular; for example if doing something in the dark outside, an Amish person might wear a headband LED lamp. Amish make ample use of handy battery-powered lighting. The simplest of all lighting, directly harnessing the power of nature. Not something you see in every Amish home, but a skylight, for instance in a bathroom, provides a limited source of natural light. Not going to work too well at night, of course. What? I thought the Amish don’t use public power in their homes. Well, for 99% of the Amish, this is true. However there is a small group of around a dozen-and-a-half churches known as the electric New Order Amish, who do permit public electricity in the home. Electric New Orders maintain numerous other Amish traditions, beliefs and practices and so are still considered along with their non-electric brethren, even though their adoption of electric means they have limited fellowship opportunities with other Amish. And where or how are the rechargeable batteries recharged? Some diesel-powered charger? Carol, Either by solar panels or off the generator. Most of us use a generator to run our washing machine so at the same time we plug in the battery charger.Or if we work somewhere at a place with electric, we may charge them at work. Sorry if this seems too judgmental, but isn’t charging your battery on your employer’s electricity not too much different from taking office supplies or bringing your home garbage to the employer’s dumpster? Just sayin…..
Never thought of that … I personally don’t do it , but I know of a few who do. Of course they would ask permission and offer to pay for whatever electricity is used. I can see where it would seem like we’re taking advantage. Hopefully everyone who uses this route has a satisfactory agreement with their employer, so no hard feelings are caused. At our home we have a few battery charging options. Like Rebecca wrote, we can charge batteries while the generator is running. Ours is set up so that anytime the generator is running, it is charging the two batteries that are hooked up to an inverter. (They run my WP, photocopier, a bathroom light and a below-septic-tank-level toilet and a few other small things.) We use solar panels, too, but that is mostly to run the electric fence in the pasture and a light in our phone shack. The third option is our freezer shack. A non-Amish neighbor owns it and rents the space to several Amish families and we keep our electric freezer in it. There are 12-volt battery chargers and outlets for rechargeable power tools and we pay a fee for keeping the freezer there and we are responsible for the electric bills, so though the owner isn’t getting rich, he is still being compensated for the use of the building etc. and some extra on top for being a helpful neighbor. 🙂 And since they have a freezer there, too, we like to share the bounty with them as well. In our community the DeWalt type lights are not often seen. In fact I can only think of one family that I know of who has one, but 12-volt battery cabinet lights are common. There you have your battery in a wooden cabinet (often with a magazine rack or the like attached) and because it’s on casters it can be rolled anywhere you want. Someone asked "where do they charge rechargeable batteries? ". They probably charge them at home. I got a real surprise at an Amish community in Tennessee several years ago. My sister and her husband’s home is furnished largely with furniture made by an Amish craftsman. I rode with my brother in law one day to pick up a bed that had been built for them. I fully expected to walk into the Amish man’s workshop and see something that was all hand tools and reticent of a 19th century workshop…like you see on the PBS program “American Woodwright”. What a shock when I walk in and hear a gas powered generator, and see as nice a set up as a modern shop – table saw, drill press, lathe, bandsaw….the works. The only thing reticent of olden times was the way the power was transferred to the tools. There was a shaft that ran the length of the back wall of his shop where the tools were all set up and to run the modern tools he powered a wheel with the generator which spun the shaft that had leather belts that ran to pulleys on the tools and could be engaged and disengaged. Didn’t really understand that part of….he could use a generator to power the wheel that spun the shaft, but he wouldn’t just simply plug the tools in as designed??? But when you walk into the house the women-folk are still cooking on wood cook-stoves, and washing and wringing out clothes by hand, but the husband is out in the shop with power tools! Someone explain that!?! And they have sawmills powered by huge diesel generators as well. About five years ago I was looking at a property for sale in Perry County. It was an Amish family that was moving and the place was for sale. The family made straw hats and had a workshop above the stable. There was a block building located about 100 yards from the house that housed a large diesel generator. The house had skylights. The electrical wiring in this place was a nightmare. Wires were stapled to walls and naked light bulbs popped out here and there. Very dangerous I thought. Certainly not up to code anywhere in the world. I suppose I’ll never understand this. While I’m not the biggest fan of electricity due to the harm I believe it causes the body, I’m even less a fan of propane and kerosene in the home. I don’t understand the deterrent to being on-grid if the Amish rely on other English products to live. Doctors are used. Factory-made cloth is used. Many Amish use canned foods, flours, etc. all made by non-Amish people. I feel that so many of these things (not the doctors) are so far from how God really wants us to live. Linen and wool were worn in biblical times because they are both incredibly healing (just not when woven together–the frequencies cancel each other out). The cotton poly-blends typically used for clothing are draining on the body. You’d think that a people group that keeps God as the center of their lives would try to live closer to the way people lived in the Bible. Don’t get me wrong, I love the Amish way of life overall. There are just many details within that lifestyle I don’t understand. What an interesting article, and the ideas expressed in the replies have been interesting too. Re saving electricity, we purchased an item called kill-o-watt which can be put on each electrical appliance to calculate the costs. Your biggest items are televisions (instant-in means they are always on, even when the screen is off), computers, refrigerators, electric heaters and air conditioners, and incandescent bulbs. The library I work at has 2 Kill-o-Watt devices which we check out for free (3 weeks at a time), so anyone interested in calculating their various electrical appliance costs might want to check with their library, first. On the other hand, we have problems with people “plugging in” anywhere and everywhere in our library, which I personally think is rude (besides, our library is run with tax dollars, so it’s ultimately taxpayers of our district footing the electric bills). They mostly charge cell phones and computers. We have to tell them not to, because they lay their cords all over the floor–our insurance company doesn’t like those kind of “trip hazards”, so we try to make sure they only use the outlets provided in our individual study carrels (tutors complain there’s not enough room for tutor and student–that’s life! Besides, the tutors are paid by students, but they use the library space FREE). What really irritates me is that the people using our outlets have to remove the child-resistant plastic plugs in order to use the outlets (most disappear)! There are even people who move books around to access outlets in walls behind the books (used for vacuuming, electrical tools). I am usually the one checking these things, since I work in the children’s dept. and don’t want any injuries on my watch! I must admit I’d use more solar/battery power for light if I knew what I was doing (using solar to recharge batteries)! I only experienced (indoors) a gas, mantel lamp once. WOW! Lots of light, alright, but WAY too much heat for my liking! Walking under it, I feared my hair might ignite! Like other commenters, I’m impressed with this article. #3 option is my favorite. The things which Amish fight over seem very petty, inconsequential and paranoid. What does one expect from a cloistered society, scratch that, I’m gonna call it a cult? Beard cutting attacks? I thought the Amish were pacifists! The fact is all religion is hypocritical even among the “chosen” Amish. I think even if there is a god, he has surely turned his back on humanity by now. Religion is a manmade concept. Atheism is the only logical way to live one’s life, whether you think there’s a supreme being or not. But, there’s a certain bliss to believing in the best selling work of fiction ever written and decided that you are one of the chosen ones who have just managed to decipher the Bible better than anyone else. The whole premise of the Amish way of life is denial. Although I consider the study of psychology to be in much need of refinement yet, denial and delusion are two habits that are clearly very emotionally unhealthy. I applaud all Amish who have the courage to break free from their chains. I know from personal experience that it is hard to deal with family that provides an unhealthy influence. I’m sorry but if a parent can choose a church over their own child then they are no kind of parent at all. Hypocrisy, lies and self-righteousness are what being Amish is apparently all about. Hey, having a close community is great and we should all learn something from that. However, I see it as nothing to applaud when it is all based on a lie to begin with. The Nazis also had a strong sense of community but it fell apart because they were more interested in making sure everyone conformed than keeping sight of what they were trying to build in the first place. I think if the Amish society were created today, it would be regarded as a cult and investigated by the FBI. Their culture is abusive towards women and children based on the current laws of our land, which even they are obligated to follow. Religious freedom is no excuse for stifling education, child labor or beard cutting attacks. Why don’t we let Muslim communities just start practicing Sharia law?! It’s the same difference as the Amish, we just can’t see it because of bias towards Christianity and tolerance of Christian extremism even while we demonize Islamic extremism. As an atheist who did not come to the decision lightly, I see the similarities plain as day. Fundamentalism is always wrong and saying Amish are ok but letting Muslim communities not practice sharia law in the US really just illustrates that the Amish are being given a lot of breaks that are unfair. Maybe I don’t want to pay into social security because it violates my most deeply held beliefs. No, I don’t have any scripture to quote about it but that shouldn’t matter. Being atheist and anti-authoritarian is my religion. The fact the Amish can get out of it but I can’t means my 14th Amendment rights to equal protection under the law are being violated. Glad you got that off your chest, man. God loves you.